The Felcone Company has published several basic reference books in the fields of New Jersey bibliography and New Jersey history, and we are a distributor of a number of other important New Jersey reference works as well as one recent non-New Jersey book. Prices are net, and shipping is $6 for the first clothbound volume or $4 for a pamphlet. New Jersey residents will be charged 6.625% state sales tax. Members of the book trade may inquire for quantity discounts on our own publications. Printing in New Jersey, 1754–1800: A Descriptive Bibliography. By Joseph J. Felcone. (Worcester: American Antiquarian Society, 2012). 8½ x 11 in. 544 pages. Cloth. Dust jacket. $125. The first permanent printing office in New Jersey was established in 1754 by James Parker. Laws, proceedings of the assembly, and proclamations of the royal governors all came from Parker's press, as did numerous works for the fledgling College of New Jersey (now Princeton University). Other printers soon saw opportunity in New Jersey, so that by 1800, forty-four individuals had been either proprietors or partners in printing offices spread across the state from Sussex County to Cumberland County. Printing in New Jersey contains full descriptions of all of the known products of every eighteenth-century New Jersey press. As a descriptive bibliography of early American imprints, this book sets a new standard for comprehensiveness. Of the 1,265 books, pamphlets, periodicals, newspapers, and broadsides included, almost a quarter of them are recorded here for the first time. Every entry receives detailed bibliographical treatment: full collations are provided, paper and type are identified, contemporary bindings are described, and advertisements in newspapers are recorded. Every located copy has been collated, and full copy-specific data, including eighteenth-century provenance, is presented. Extensive notes identify anonymous authors, provide biographical and historical context, attribute unsigned printing, and establish press runs. The second part of the text is devoted to items that may have been printed in New Jersey but for which insufficient documentation has been found to permit a clear attribution to a New Jersey press. A third part contains works incorrectly attributed to a New Jersey press by earlier bibliographers and now removed from the New Jersey printing canon. The rich back matter supports the bibliography. The first of three appendices lists the alphabetical, chronological, and geographical distribution of printing offices in eighteenth-century New Jersey. The second appendix is a register of the New Jersey book trade that records printers, publishers, booksellers, newspaper proprietors, bookbinders, papermakers, and others engaged in any aspect of the book trade or allied arts in New Jersey from 1754 through 1800. The third appendix contains six concordances. An extensive list of manuscript collections and printed resources essential to the study of eighteenth-century New Jersey printing documents the work. The volume concludes with three indexes: an index of printers and publishers, a provenance index, and a comprehensive general index. This important book is the winner of the 2014 Bibliographical Society of America top prize for outstanding scholarship in the bibliography of American history or literature. 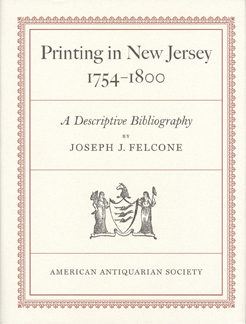 Printing in New Jersey, 1754–1800: A Descriptive Bibliography is distributed for the American Antiquarian Society by Oak Knoll Press, where additional information is available. Copies may be ordered from either Oak Knoll or the Felcone Company. Portrait of Place: Paintings, Drawings, and Prints of New Jersey, 1761–1898, from the Collection of Joseph J. Felcone. (Princeton: Morven Museum & Garden, 2012). 8 x 11 in. 77 pages. Color illustrations. Paper. $18. Catalogue of an exhibition of 120 privately owned views of New Jersey executed before 1900. Each view is illustrated in color, with detailed descriptive text. Oil paintings, watercolors, drawings, and separately issued prints spanning the entire state from Sussex County to Cape May County. Fully indexed. A fine reference work on early New Jersey iconography, compiled by Joseph Felcone. Portrait of Place received the 2013 New Jersey Author’s Award, in the reproduction of primary sources category, presented jointly by the New Jersey Studies Academic Alliance, the History and Preservation Section of the New Jersey Library Association, and the Special Collections and University Archives Division of the Rutgers University Libraries. Copies may be ordered from either Morven Museum & Garden or the Felcone Company. New Jersey Copyright Registrations, 1791–1870. By Joseph J. Felcone. (Princeton: Joseph J. Felcone Inc., 2017). 6 x 9 in. 188 pages. Cloth. $38. Copyright registrations provide important information for local historians as well as bibliographers and book historians. Beginning about 1850 these records also offer valuable insight into regional manufacturing, popular music publishing, the production and advertising of patent medicines, and photo-graphy. The present book contains all the known New Jersey copy-right records from the first registration in 1791 through the middle of 1870, when all copyright activities were removed from the individual states and consolidated in the Library of Congress. Preceding the chronological record of registrations is a very brief examination of the origin and history of copy-right legislation in New Jersey and the mechanical require-ments mandated by that legislation. A commentary on the editorial process completes the introductory text, and a comprehensive index concludes the volume. For the first fifty years of New Jersey copyright registrations, almost all applications were for books and pamphlets. The exceptions were generally maps and an occasional chart or single piece of music. Authors were Jersey residents, and the printers and publishers were usually in New Jersey. After the mid-1840s, applications for music increased as popular interest in sheet music grew. In 1848 the first application for a package label was recorded. Over the next two decades, registrations of labels increased exponentially, particularly for patent medicines. By the final decade of New Jersey registrations, only one third of applications were for books and pamphlets, while a third were for labels and trademarks of New Jersey products, and the remaining third were for other forms of printed and graphic matter. The latter included sheet music; maps; charts and tables; photographs; engravings and lithographs; brochures and circulars; periodicals; and designs. The applications came from every county in the state, and from major cities as well as small towns like Smith’s Landing, Atlantic County, and Pokeville, Warren County. They often record titles of books, pamphlets, and maps that have not survived or were never published. The rapid development of the patent medicine industry in Newark, Trenton, and elsewhere in New Jersey is revealed by the many labels, dosing directions, and hyperbole-laden advertisements. One finds registrations for games and toys manufactured by the Harold Brothers of Plainfield; for photographs from several of New Jersey’s earliest photographers; and for hundreds of popular sheet music titles produced by the J. L. Peters Company. The exhaustive index lists all personal names, geographical locations, and subjects. The Printed Assembly Minutes & Laws of New Jersey, 1703–1732: A Bibliographical Study. By Joseph J. Felcone. (Princeton: The author, 2016). 6 x 9 in. 45 pages. Paper. $15. On April 15, 1702, New Jersey became a royal colony when the proprietors of East New Jersey and the proprietors of West New Jersey jointly surrendered the right of government to the Crown. The proprietors retained the right to the soil. The governor would be a Crown appointment, and he would choose the members of his council. The assembly would consist of twenty-four elected members—twelve from East New Jersey and twelve from West New Jersey—and it would meet alternately at Perth Amboy and Burlington. The first royal governor, Edward Hyde, Lord Cornbury, arrived in New Jersey on August 11, 1703, and the first session of the first general assembly convened at Perth Amboy on November 10 of that year. The printed record of New Jersey’s government during its first three decades has long been bibliographical terra incognita. The printed assembly minutes range from no known copies of some sessions to three copies of others. The laws have survived in slightly greater numbers, but the total universe is not large and is spread among a relatively small number of repositories. A significant number of the imprints are not yet in ESTC. Much of the official printing was done by New York printer William Bradford, who was New Jersey’s exclusive government printer for the royal colony’s first twenty-five years as well as clerk of the New Jersey assembly beginning in 1711. The printing was done piecemeal, as it was ordered by the assembly. Pagination and signing are inconsistent and often hopelessly erratic. In an effort to keep the market supplied with laws in force, Bradford reprinted numerous laws, as well as some individual sheets, as his stock was exhausted. Pagination and signing were often changed in the reprints. Further confusion was introduced by early lawyers as well as later collectors and librarians, all of whom disassembled and mixed and matched and reassembled pieces in efforts to build as complete runs as possible. No less a bibliographer than Douglas McMurtrie, when writing in 1932 and again in 1935 on the first New Jersey imprint—the 1723 Perth Amboy laws—failed to recognize the relationship between original and reprinted sheets. This essay at last unravels the printing history of the earliest New Jersey assembly minutes and laws, and it locates and describes all known copies of each. The Printed Assembly Minutes & Laws of New Jersey, 1703-1732 received the 2018 New Jersey Author’s Award, in the reference category, presented jointly by the New Jersey Studies Academic Alliance, the History and Preservation Section of the New Jersey Library Association, and the Special Collections and University Archives Division of the Rutgers University Libraries. The Arcade, Greenwich, Cumberland County, New Jersey: The Land, the House, and the People over Three Centuries. By Joseph J. Felcone. (Greenwich: The author, 2013). 6 x 9 in. 55 pages. Illustrations. Paper. $15. One of 150 copies, privately printed. A documentary history of the 1830s house on Ye Greate Street in Greenwich, lovingly restored by the author and his wife. Includes a brief account of this unspoiled gem of a Southern New Jersey town, settled about 1686. New Jersey Books, 1698–1800 and New Jersey Books, 1801–1860. By Joseph J. Felcone. (Princeton: Felcone Co., 1992–96). 2 vols. 6 x 9 in. 315 pages; 812 pages. Frontis. Cloth. Vol. I, $40; vol. II, $25. A 10% discount applies to the purchase of the two-volume set. Only a few copies of vol. I remain. Together these two volumes comprise the finest single reference work on early New Jersey books. Over 1,400 books and pamphlets are described in considerable bibliographical detail, and the history of each book or pamphlet is given in the context of the New Jersey events which led to its publication. The authors of many anonymous and pseudonymous works have been identified for the first time, largely through contemporary sources. More than a few commonly accepted New Jersey stories have been disproven. An essential reference book for libraries, a basic tool for antiquarian booksellers, and a great gift for a New Jersey collector. Printing in Princeton, New Jersey, 1786–1876: A Bibliography. By Joseph J. Felcone. (Princeton: Princeton University Library, 1992). 6 x 9 in. 159 pages. Illus. Cloth. $35. A detailed bibliography of books, pamphlets, and broadsides printed in Princeton from the establishment of James Tod's press in 1786 through the year 1876. In addition to job printing for the college and the theological seminary, Princeton printers did work for the Delaware and Raritan Canal Company, political and charitable organizations, New York and Philadelphia publishers, and many private individuals. Children's books, magazines, literature, poetry, annual reports, and orations all came from Princeton presses and all are described herein, along with the locations of known copies. New Jerseyana, 1668–1984: Being a Catalogue of 4,328 Rare and Out-of-Print Books and Pamphlets, Autograph Letters and Documents, Newspapers, Prints, and Ephemera. (Princeton: Felcone Co., 1988). 6 x 9 in. 294 pages. Cloth. $40. Our Catalogue 28, issued between 1984 and 1988, describing the largest collection of New Jersey books and pamphlets, manuscripts and documents, and related New Jerseyana ever offered for sale. The exhaustive index fills nearly 50 double-column pages. This is a useful single reference guide to New Jerseyana, from early and rare books to modern local histories, genealogies, scholarly and reference books, &c. Although the prices are now out-of-date, the information is entirely current. Only about 30 copies remain. A descriptive catalogue of nearly 300 privately-owned New Jersey broadsides dating from 1773 to 1899. Each broadside is fully described, and a comprehensive index gives full access to these important but ephemeral records of New Jersey life. Collecting New Jersey Books. By Joseph J. Felcone. (Union City: Wm. H. Wise Co., 1978). Pages 265–287 p. Illus. Paper. $40. One of 50 copies reprinted for private distribution from Collecting New Jersey Antiques. A good summary of the subject, but complete with 34 publisher-created typographical errors, several alterations and deletions from the submitted manuscript, and various other editorial and printing atrocities. With this volume the William H. Wise Company's "Books About New Jersey" series reached the nadir of book publishing, and the firm soon went out of business. Trenton Index: A Combined Index to John O. Raum's History of the City of Trenton, New Jersey, Francis B. Lee's History of Trenton, New Jersey, and John Hall's History of the Presbyterian Church in Trenton, N.J. (2d Edition). By Joseph J. Felcone. (Princeton, 1976). 6 x 9 in. 87 pages. Paper. $10. A comprehensive combined name-and-subject index to the three major unindexed nineteenth-century histories of Trenton, and an essential key to Trenton historical and genealogical research. Ewing Township, Mercer County, New Jersey: A History to the Year 1700. By Joseph J. Felcone. (Princeton, 1985). 6 x 9 in. 43 pages. Paper. $10. A very detailed history of the earliest settlement of the area along the Delaware River just north of Trenton. Compiled entirely from documents and other primary sources. Land Transactions in Ewing Township, Mercer County, New Jersey, 1687–1760. By Joseph J. Felcone. (Princeton, 1983; reprinted 2008). 8½ x 11 in. 188 pages. Folding map. Cloth. $75. Second printing. Transcriptions of every pre-1760 land-related document pertaining to present-day Ewing Township, Mercer County (then Hopewell and later Trenton Townships, Hunterdon County). Deeds, mortgages, surveys, etc., including many unrecorded and privately-owned documents. With a full index including every name appearing in every document. The Cruise of the Manatee: The 1941 Journal of a Young Artist Discovering the Coastal South. By Helen Schuyler Hull. (Princeton: Privately printed, 2019). Edited and with an introduction and notes by Joseph J. Felcone. 6 x 9 in. 120 p. Illustrations (some in color). Paper. $10.00. Helen Schuyler Hull had just graduated from the Pennsylvania Academy of the Fine Arts, where she won the European Travel Prize in her last year. But it was 1941, and travel in Europe was out of the question. Helen’s husband, Morgan Milton Hull, had graduated from the Academy the previous year, and he, too, had won the European Travel Prize. The solution (with the school’s blessing): buy a boat and travel from Philadelphia to St. Augustine, Florida, via the Intracoastal Waterway, discovering coastal America and painting along the way. From June through September, 1941, Helen kept a daily journal, describing—often in considerable detail and always with the eye of an artist—the small coastal towns, the local residents and their daily lives, and the natural beauty of the waterways and the surrounding country. The journal concludes with an account of a ten-day trip along the Gulf coast to New Orleans. Helen records a rural coastal way of life that had seen almost no change in a hundred years. But just a few months after the journal ends, with the attack on Pearl Harbor and the United States’ entrance into the war, that way of life would disappear and never return.